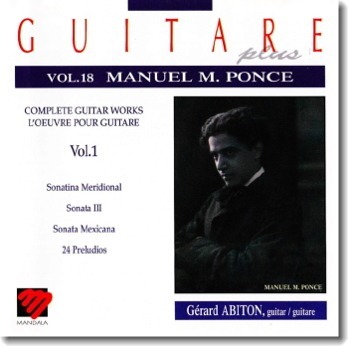 This disc is the first one of a complete set of M. M. Ponce’s guitar work. Who better than Gerard Abiton could undertake this work ? As a matter of fact, a rare symbiosis seems to exist between this composer and this performer. (...) In Gerard Abiton’s hands, this music flows naturally and finds his best emotional translation. It’s splendid, there is nothing else to add except that each music lover can be happy to see Gerard Abiton finally realizes what should be an old dream and that the result is quite equal to the ambition and the expectations of the French master. Let mention,also, the perfect sound recording.